Professionals in the ice and snow removal industry understand the advantage of pre-treating outdoor areas with a liquid de-icing agent, but it can be challenging to get customers onboard with the process. 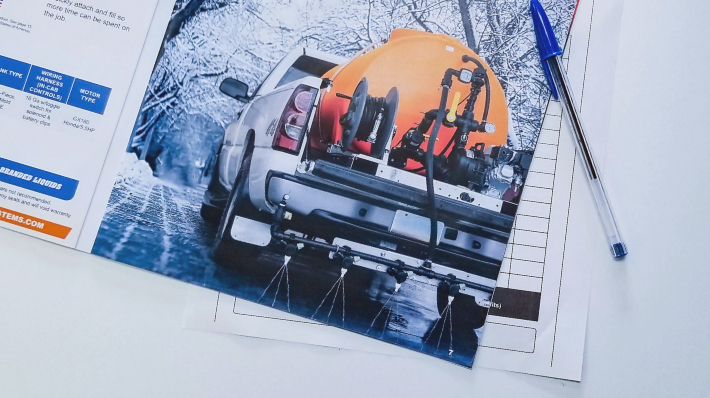 Our team at Ice Master Systems has developed a guide on how you can explain the many benefits of working with liquid snow and ice clearing products to your clients. What better way to showcase the advantages of the pre-treatment process than by showing them how the pre-treatment works on test areas? When you have small strips of the property treated with the de-icing liquid, you can show the client that the liquid agent works and that the property maintenance work could be completed more efficiently when liquid is used throughout the area. Be careful to go over the testing process carefully with the client beforehand and ensure that you don't overextend your resources to complete the test. Pro tip: Using a portfolio of photo examples will help your customer visualize the value. Visuals that display these top 5 benefits of using liquids for de-icing and anti-icing will help you in a big way. One of the most common dangers of snow and ice on a commercial property is that those using the space will slip and fall and the owner will be liable for any damages sustained. Slips and falls are more common in cooler temperatures, with the snow and leftover moisture turning to solid ice. A leading benefit of the latest liquid pre-treatment de-icing products is it can be used to remove ice in colder temperatures effectively. While rock salt can be effective, its performance weakens as the temperatures dip, and pre-treatment can help ensure optimal protection. The environmental benefits of liquid pre-treatment de-icing products are another consideration when selling the value of liquids to your clients. Many business owners are now looking at ways of mitigating the impact of their operations on the environment, and homeowners are also becoming more environmentally-focused. You can harness this new environmental focus to promote your pre-treatment products. The use of de-icing liquids has limited the number of total treatment products required during your maintenance work, and this means that you won’t be using large amounts of harmful products when you work with the latest pre-treatment systems. One of the leading benefits of using pre-treatment liquids such as brine within the de-icing process is the economic value derived from the work. Industry insights show that snow removal and building maintenance teams can save significant amounts of time and resources by using a liquid de-icer to treat the space rather than rock salt. When liquid de-icing agents are used, the research shows that the agents can quickly remove ice and snow and any further work is minimized due to the product's working efficiency. Another economic advantage of liquid de-icers is that it requires fewer team members to complete the de-icing work compared to those using the same amount of rock salt. That can help reduce labor costs considerably for contractor work. Now that you know a little bit more about the value of de-icing agents and how to promote them to your clients, let's look at the elements to consider when speaking with your clients about the potential use of de-icers on their facility. It's your job to know exactly how the de-icing agents work to minimize the amount of snow and ice on the property. You'll be expected to answer a number of questions, and so you should do as much research as possible before bringing the product to the customer. It’s normal for customers to be wary of new products being used on their property. Make sure you don’t respond abruptly to dismissive reactions. Simply showcase the data highlighting product value and offer to conduct a test on a small area of the property to show them exactly how the product works. The economic value of the de-icing agent is the most important factor, and your success in selling the process to your customers will be primarily dependent on you showing them that the cost-effectiveness of using liquid de-icers makes sense. Our team is here to guide you in working with liquid de-icing agents in your snow and ice removal processes. I hope you have found value in this post and would appreciate you feedback.